Socialized Dogs Vs UnPolite Aggressive Dogs | Scoop The Poop! The right kind of socialization is essential to the normal development of a family pet. Dogs are social creatures that crave the attention of people and the companionship of other dogs. 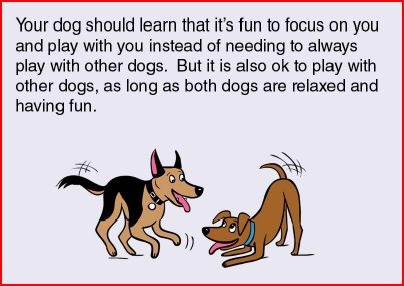 This ability to spend time with both people and play with other dogs does not just come about naturally , it must be carefully fostered. The easiest and most important time to socialize a dog is when it is a puppy between the ages of 8-18 wks of age. This is the time in your puppy’s life when he is most impressionable and open to meeting new people, and other puppies and adult dogs. Playtime with other dogs is essential at this age but should be carefully monitored so that your puppy learns to adjust it’s playstyle to the dogs he is playing with and not adopt bad habits. If your dog usually plays too rough for instance, it is important to break up this roughness after 5-10 minutes and redirect the puppies onto another game. Make sure that your dog gets to play with all different ages, sizes and temperaments of dogs so that he doesn’t just play rough with everyone. If his only experience of other dogs is rough play, he will get himself in trouble with adult dogs as he grows up. Learning how to adjust his play to the dog he is playing with is a crucial aspect of doggie social etiquette. Many dogs are not trained to behave politely on a leash, and though they play with dogs off leash on a regular basis, they have no idea how to interact with another dog on a leash. An untrained dog will do all kinds of obnoxious things when he meets other dogs, which you might consider playful but other adult dogs consider rude ! Dogs have rules about personal space and polite greetings, most of which involve not being jumped on, mounted or pawed at until they have met and established themselves. Letting your dog drag you over to another dog and letting him climb on the other dog or mouth it, is rude in dogspeak and can result in an unpleasant snap, growl or bite. Knowing how to behave on leash does not come naturally to most dogs and so without your input they will never figure out why they are not well received by other dogs. I personally believe that many cases of on leash dog aggression get started this way. Dogs who are adolescent look like adult dogs but their brains are still puppies. They rush over to an adult dog and start acting like a puppy, but they are almost full grown. All the adult dog sees is a rude dog that needs correcting so he snaps, growls or maybe bites to fix the rogue and the young dog has his first bad experience with another dog. If this happens often enough and is scary enough the young dog starts to think other on leash dogs are no fun and begins to act defensively and eventually aggressively. 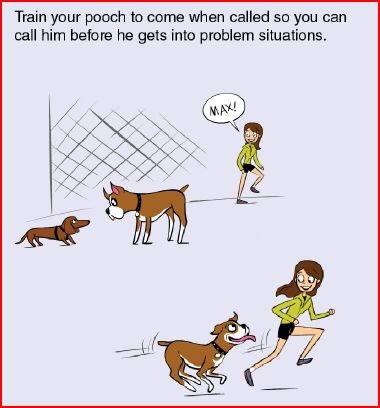 This cycle perpetuates itself and you end up with on leash aggression toward other dogs. On leash aggression problems can be avoided if you, as your dog’s advocate and trainer, take the time to teach your dog how to behave politely on leash. Start by teaching him how to sit and stay until he’s released to say hello to another dog. Approach another on leash dog from the side rather than head on. Keep your leash loose and don’t pull on your dog when he’s sniffing another dog. Teach a long duration leave it, which means turn a way from the other dog and look at me. Use a Gentle Leader Headcollar to help control your dog’s head and prevent him from jumping all over the other dog. These steps will help your dog learn how to remain under control around other dogs. It is not enough to simply socialize your dog , you must also teach him how to greet other dogs when confined to a leash. Before he is ready to handle himself completely around other dogs he must learn how to walk without pulling, hold a sit or down/stay close to another dog, and leave it, with a long duration of looking away from the other dog and back at you. On leash aggression for normally social dogs is a failure on the owner’s part to teach their dog how to greet other dogs on leash. So get out your clicker, treats and gentle leader, and get busy working on your dog’s leash manners today!